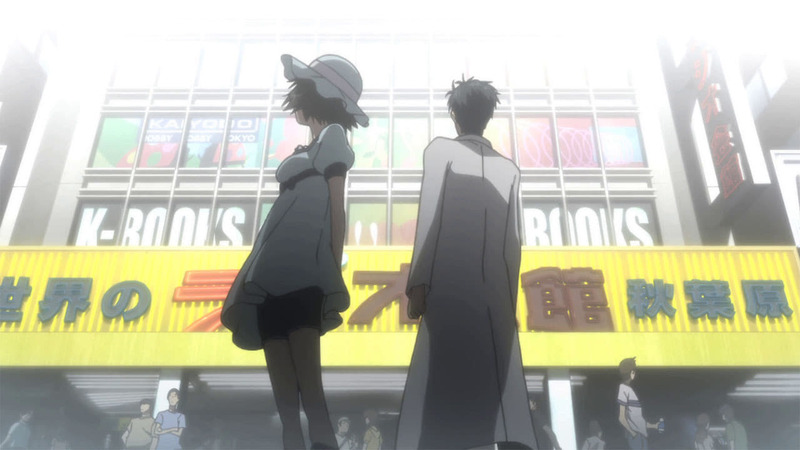 Self-proclaimed mad scientist, Rintarō Okabe, goes to a seminar on time travel with his friend, Mayuri Shiina. Whilst there, he meets a girl named Kurisu Makise who explicitly states that he had met her 15 minutes ago, despite having never met her before. Later on, Rintarō hears a scream and discovers Kurisu had been stabbed. As he sends a text to another one of his research buddies, Hashida Itaru, Rintarō experiences a strange experience and finds the street he is on has suddenly become deserted and a strange sattelite had crashed into the building he was just in. Later on, whilst fiddling about with their strange remote-controlled microwave, which turns bananas into a gel-like substance, Hashida tells Rintarō that the seminar he supposedly attended was cancelled, much to his surprise. Rintarō later discovers that the text he sent to Hashida had been sent to a week ago, just before encountering Kurisu, who is alive and well.